Okay, I said I'd share more about eko compost. I can't really vouch for what's in it, although the website provides some amazing information about what constitutes good compost and how much is their product. 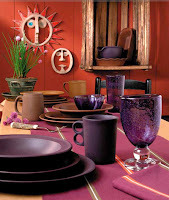 Bennington Potters is a company out of Vermont that sells machine-pressed, hand-finished pottery. Meg and Ambrose deserve credit for finding these folks for me; they registered there when they got married. I have always loved the idea of having handmade pottery (this is close), and I waited and waited because I kept thinking that if I got married, I'd admittedly copy Meg and Ambrose and want to register for pottery dishes and bowls and such. Well, fellas, the pressure's off - I've gone and done it and I'm getting my dishes. I got a set of four dinner plates from my mom for Christmas, and I think they're the cat's pajamas. The nice thing about this company is that even though they do utilize a pressing machine to make their products, real people finish them. (as opposed to fake people, I know). Their stable business model means that their basic colors will be available for a long time (and I may need a long time before I'll actually be able to get that wedding registry!). So, I'm starting out with some dinner plates, and every once in a while, I'll add a little bit more to my collection. I can't get them all at once, but it sure beats waiting around and pining for a proposal just so I can have my dishes. Boy, I'm realizing I'm bordering on the ridiculous today... or am I past bordering and just downright ridiculous? Moving on... 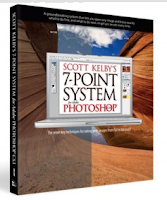 I did finally get into Scott Kelby's 7-Point System for working with your photos. Erin posted an action on her website, and after trying hers out, I'm totally hooked. Sometimes the book feels painstakingly slow, but I feel like I'm beginning to understand how much more photoshop has to offer... it's a whole new world!